Who Is Heirloom Bulb Girl? Rhonda is one of the rare ‘free spirits’ that listens to her intuition as she goes where the wind blows. The other day she told me she drove to San Angelo, and picked up two African missionaries who were walking on the side of the road. That’s Rhonda. I first met Rhonda after the floods. For some reason, she felt compelled to find me. We met at the local coffee shop for Bible Study, and we have been friends ever since. Rhonda helps with The Garden Project. Yesterday, we figured out that nailing old wood signs to cedar posts was not her talent, as she bent every single nail she hammered. Rhonda’s gift is in creativity with rocks. Rhonda loaded up gorgeous rocks from her house on the river, and created an elaborate rock archway around a tree that is incredible. Truly, my gardens are so blessed by her creative soul. The other day, Rhonda showed up with a bucket of 100 year old daffodils. An old house by her family homestead was over-run with the beautiful bulbs. Needless to say, I was thrilled. It’s one thing to create art from rocks, but it’s a whole new level of admiration to bring me heirloom bulbs!!!! 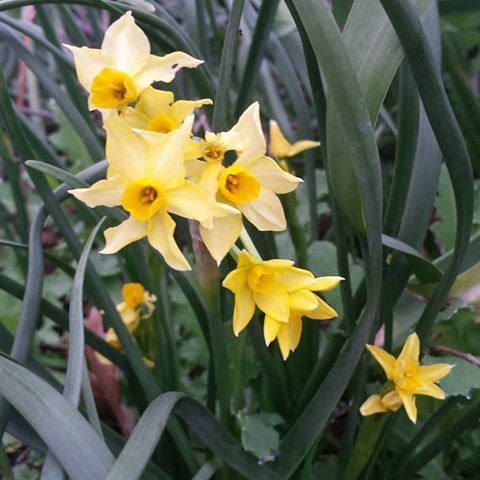 The bulbs are an unknown variety of Daffodil bliss. I absolutely adore them. I’ve separated them and planted them near an old-fashioned fence. I have also planted Lady Yellow Banks Rose to grow over the archway, so next Spring, it will be completely enchanting. Rhonda’ s heirloom bulbs are now a prized part of my gardens. I am looking forward to putting up one of her crooked nail signs and labeling the bulbs after I do a little more research. Gardens make good friends indeed. Happy Gardening to you, my garden friends.